Microsoft wants everyone to check out Mass Effect 3's new multiplayer mode, and it's willing to let them have free access to Xbox Live to do it. Demos are generally great for two reasons. You either get to test pilot a title you aren't familiar with-see if the controls and tone fit your personal style-or get a sneak peek at something with which you're already familiar, but squirming with impatient excitement to get your hands on. 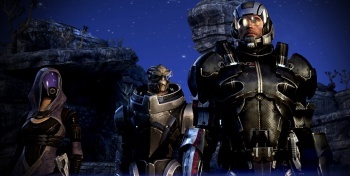 In the case of Mass Effect 3, the majority of interested players have already delved into the game's action RPG universe, but there's still something no one but BioWare and its legion of QA monkeys have tried before: Mass Effect multiplayer. According to Microsoft, this is something everyone should have a chance to try out, regardless of the status of their Xbox Live subscription. "In celebration of ME3, Xbox is pleased to provide fans access to ME3 demo multiplayer for the time leading to launch," read a note sent by Microsoft to the BioWare gang. "Xbox LIVE Gold gives you exclusive benefits including multiplayer gaming, member-only deals & previews, and access to entertainment with Netflix, ESPN, Hulu Plus and more." It's difficult to say exactly when and how this free access to Gold will take place, but technically speaking, the "the time leading to launch" would be from the public launch of the demo on February 17th to the game's release on March 9th, a full three weeks later. It's a bit hard to believe that Microsoft would hand anyone who downloaded the demo a twenty-one-day pass to its subscription service, but then again, that's how long the demo is active, and the note did mention all of the benefits of a Gold subscription, not just limiting its announcement to the Mass Effect 3 multiplayer. While we're not yet sure how players will access Gold, we do know the rest of the details on the demo itself. Players who activated/purchased Battlefield 3's online pass start their fight against the Reapers on February 14th, while everyone else can join three days later on the 17th. The demo will (of course) include a multiplayer mission, as well as an early mission of the single player campaign.